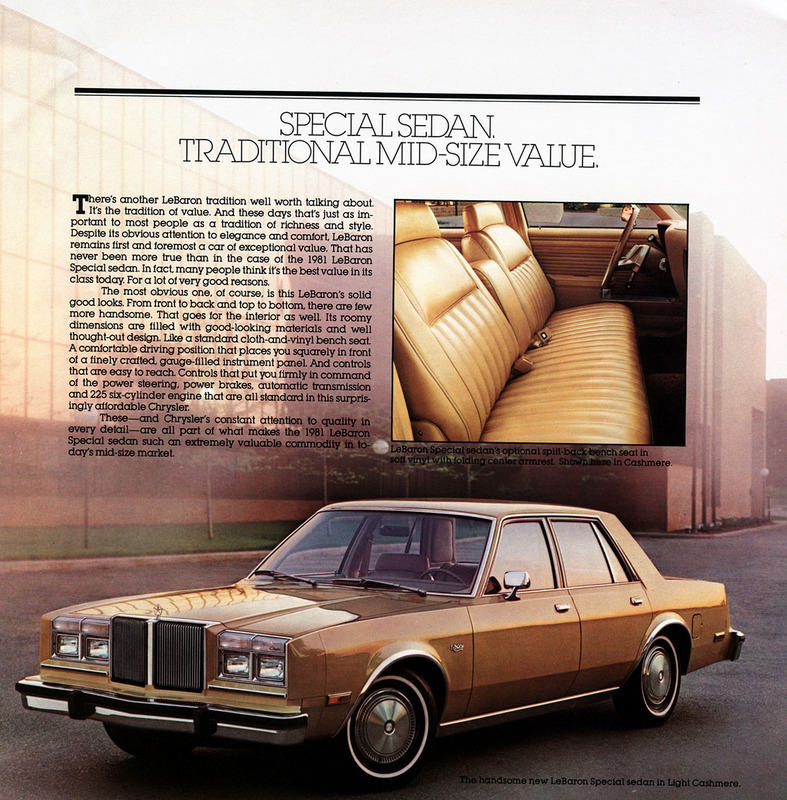 1981 Chrysler LeBaron Special – a stripper with a nice face. The so-called Malaise Era – the turbulent 10 years from (roughly) 1973 to 1983 – brought us many automotive gems. Who can forget that heady time when a 460 cubic inch Lincoln V-8 (7.5 litres) managed to wheeze out a paltry 190 horsepower? 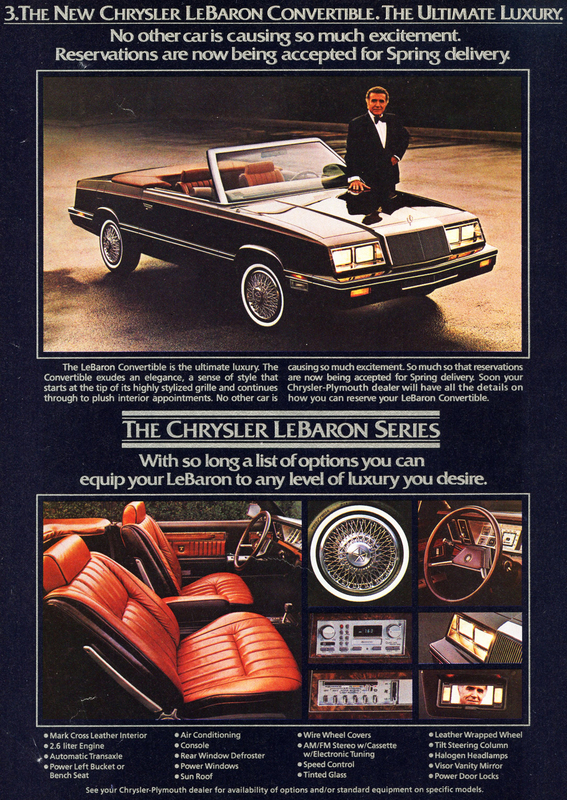 1981 Chrysler LeBaron Salon coupe, the Special’s higher achieving sister. In addition to smog-choked land yachts, the Malaise Era also brought us leisure suits, wide lapels, disco, and Three’s Company. Obviously, we owe it a debt of remembrance, if only to say ‘never again’. Horsepower values reached their deepest trough in 1981, the same year gas prices and interest rates skyrocketed to their tallest postwar peak. No automaker was struggling more than Chrysler at that time, and besides the new K-car (which ultimately saved the company) malaise wasn’t hard to find in the showroom. A great example of this is the 1981 Chrysler LeBaron Special – a Chrysler with all the trappings of a low-end Plymouth. 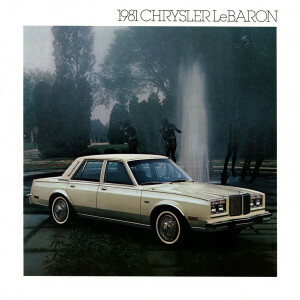 To squeeze every last sale out of its lineup, Chrysler fielded a bare bones version of the M-body LeBaron (1980-1981), touting its value and affordable status. With a venerable (but emissions strangled) 225 cubic inch Slant Six under the hood making a pulse-pounding 85 horsepower, the 3,368 pound sedan could rocket to 60 mph in 18.8 seconds, just slightly less than eternity. A trusty 3-speed Torqueflite automatic rounded out the drivetrain. Clearly, the Special didn’t give up a whole lot in looks compared to its high-end stablemates. Inside, luxurious vinyl bench seats whispered “cop car” or “fleet rental” into the driver’s ear, but the happy motorist was probably too busy enjoying his or her standard power brakes. Outside the vehicle, the costly vinyl roof and wire wheel hubcaps seen on higher end versions were substituted for bare metal and pie plates. Yes, this was indeed a base Dodge Diplomat with LeBaron front and rear fascias, but desperate times call for desperate measures. The M-body LeBaron and its stripper base model didn’t last long, though. After ’81, the name was applied to a new front-wheel-drive, K-car based model, while the rear-drive M-body platform carried the upscale New Yorker model until 1989. 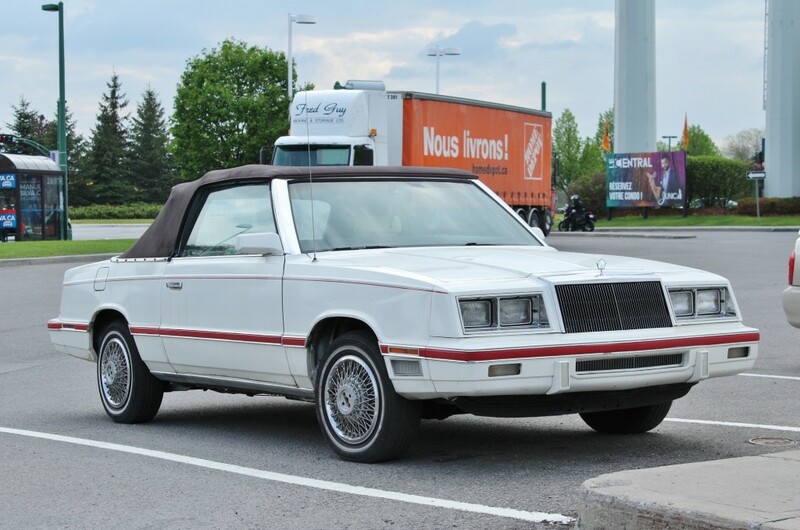 This entry was posted in Musings and tagged Chrysler LeBaron, Chrysler M-body, Dodge Diplomat on July 13, 2015 by Steph Willems. Reagan-era pride: 1982-83 Chrysler LeBaron, spotted in Gatineau, Quebec. It was, and still is, a status symbol born of 1980s America. 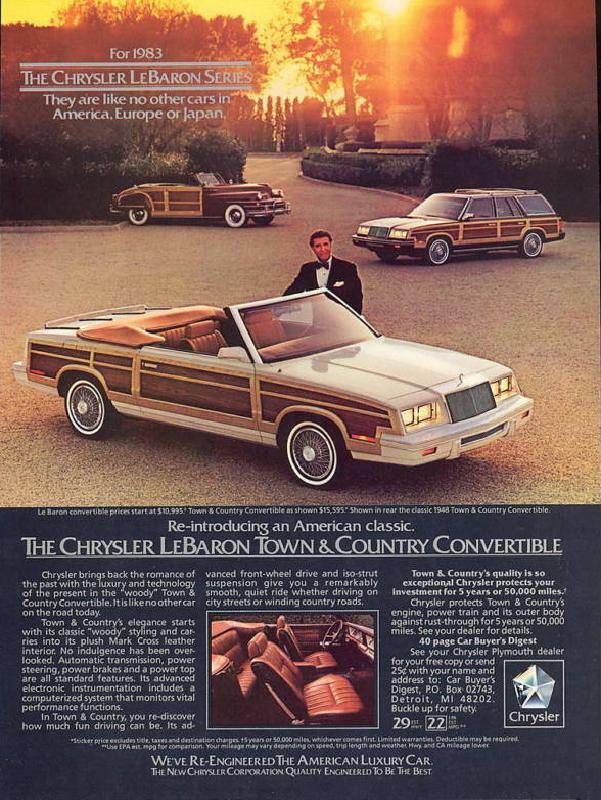 The Chrysler LeBaron convertible. 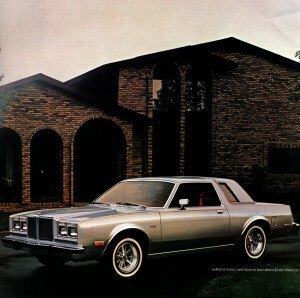 Loved by many (especially Lee Iacocca and Jon Voight*), it was the first spin-off of the 1981 K-car architecture, and brought top-down motoring back to U.S. shores. Sadly, you don’t see many of these soft-tops plying the roadways anymore. This 1982-83 example ditched the Town & Country’s fake wood veneer in favour of some sporty red pinstripes. All in all, it’s not in bad shape, though spots of rust are forming and the trim – like that of many old models – is starting to become misaligned. Ricardo Montalban doing what he did best – hocking Chryslers. While the LeBaron name had been used on and off by Chrysler for some time, it is these 1980s front-wheel-drive compacts that people most associate with the name. 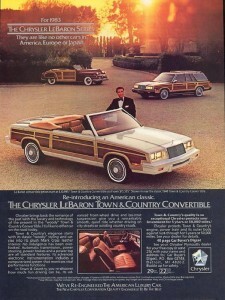 Hot on the heels of the bankruptcy-busting 1981 Dodge Aries/Plymouth Reliant twins, Chrysler’s 1982 introduction of the LeBaron sedan, coupe, wagon and convertible helped squeeze as many products as possible from an existing platform (in order to put the company’s finances firmly in the black). Joined by its stablemate, the Dodge 400, the new ‘Super-K’ aimed to bring luxury to the still-novel domain of front-wheel-drive American vehicles. At the time, the U.S. was still struggling from the effects of a recession and high gas prices brought on by the Iranian Revolution. Value for money was everything, which explains why Americans flocked to buy the cheap-but-roomy Aries and Reliant starting on Day 1. 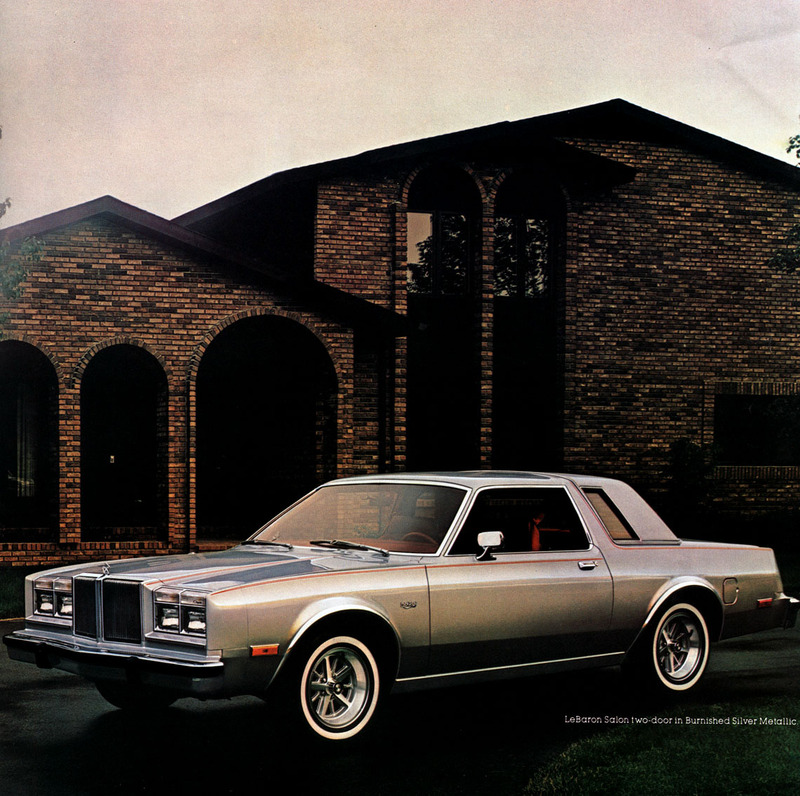 In order to capitalize on the success of the first year K-cars and solidify the company’s comeback, Chrysler Corporation released a now-famous television commercial starring chairman/saviour Lee Iacocca. Mechanically, the early K-derived LeBarons harnessed the same hardware as their lesser brethren. A carbureted 2.2-litre four-cylinder made 84 horsepower and 111 lb-ft of torque, mated to a 3-speed Torqueflight automatic transmission or less-common 4-speed manual. The man’s desire for Chryslers was insatiable. Optional was the 2.6-litre four borrowed from the Mitsubishi Astron. Also carbureted, this hefty 4-banger made 114 hp and 146 lb-ft, and served as the K-class upgrade engine until the Chrysler-made 2.5-litre came on board in 1986. Starting in 1984, LeBaron owners could outfit their ride with a turbo version of the 2.2 and finally enjoy top-end performance (the stock engine was tuned for low-end torque, but ran out of steam fast). Despite not being designed for it, the 2.2 proved to be very adaptable – several increasingly powerful versions of the turbo 2.2 were built before the engine ceased production in the mid-1990s. While their numbers dwindle each year, we can find comfort in the fact that LeBaron convertibles will always live on through their many movie and TV appearances. ‘Planes, Trains, and Automobiles’ (1987) features many memorable road trip scenes in a LeBaron Town & Country, while a 1994 episode of Seinfeld immortalized the same model as the too-good-to-be-true ‘Jon Voight car’. Long live the Jon Voight car. This entry was posted in Spotted in the wild and tagged Chrysler Corporation, Chrysler LeBaron, K-car on May 22, 2015 by Steph Willems.